» Forum » Market » Buying and selling advice » No Good Gofer price check. » No Good Gofer price check. No Good Gofer price check. 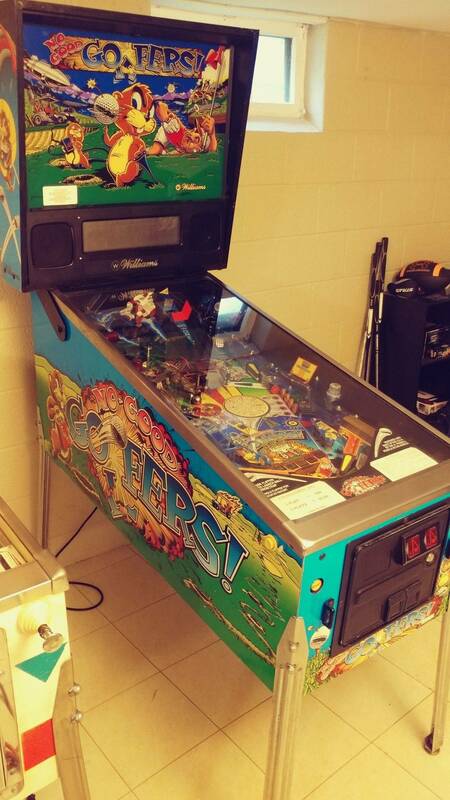 I recently went and checked out a 1997 Williams No Good Gofer and would like to get a value opinion. 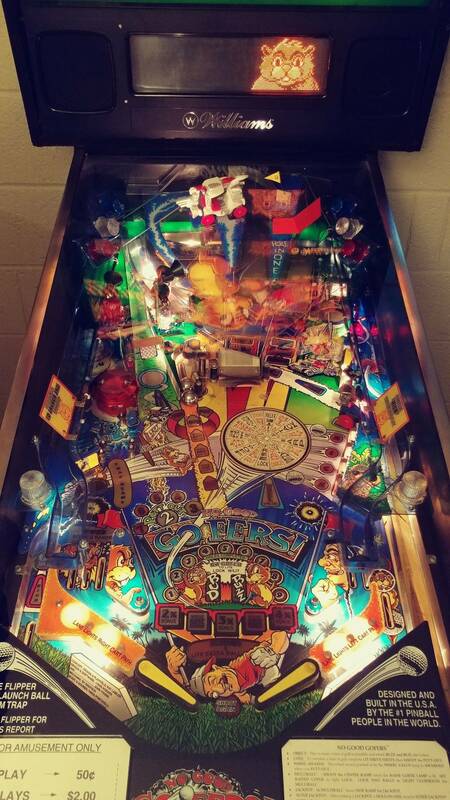 Its In good shape with everything working (except 2 playfield lights). It has new rubbers and was upgraded to LED lights on the top areas. The Cabinet is in great shape with just very minor paint chips on the top corners. 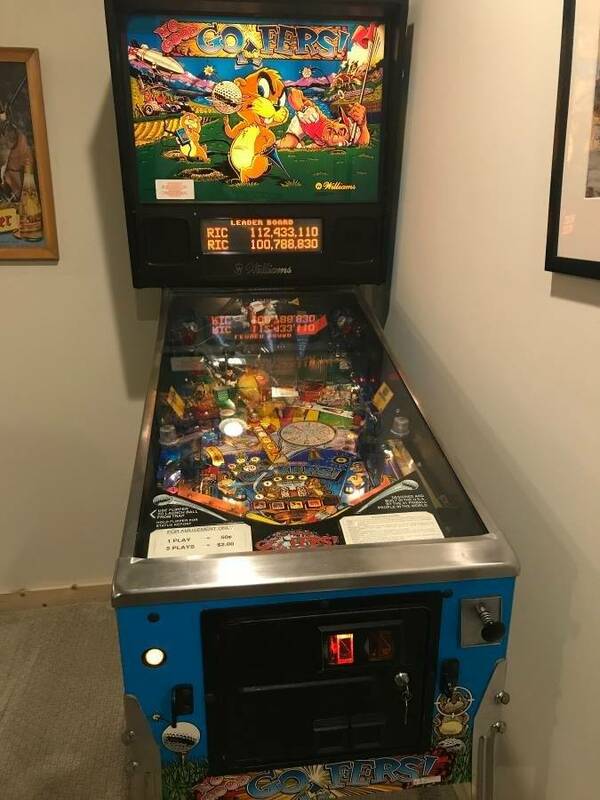 The playfield has minor wear but looks to be in good shape (could use a shop job, looks like it needs a Novus cleaning and some wax). 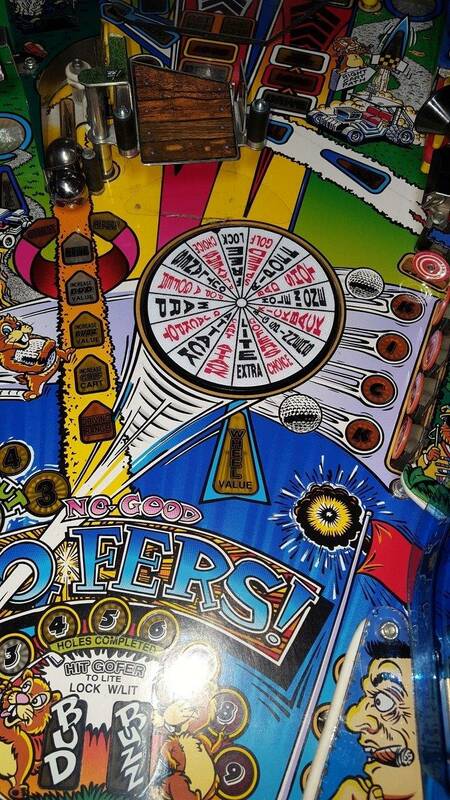 The gofers have decent paint wear and the spin wheel looks worn out (hard to read) but it still spins fine. Everything plays well and like I said it looks to be in great condition otherwise. We made a deal at 3k and just want to make sure knowing it needs a shop job that its still a good deal, I put a down payment on it and plan to go back tomorrow to purchase/pick up. I love golfing so I feel this is a good purchase. The pictures you posted make it look in nice condition and I think you are getting a good deal. Pinside estimate is $3500 to $4000 and you don't often see them below $3000 without issues. The spinner sticker is easy to replace and less than $20. You can repaint the gofers if the wear bothers you. I saw the Pinside estimate but just wanted to get some verification as its my first real purchase. 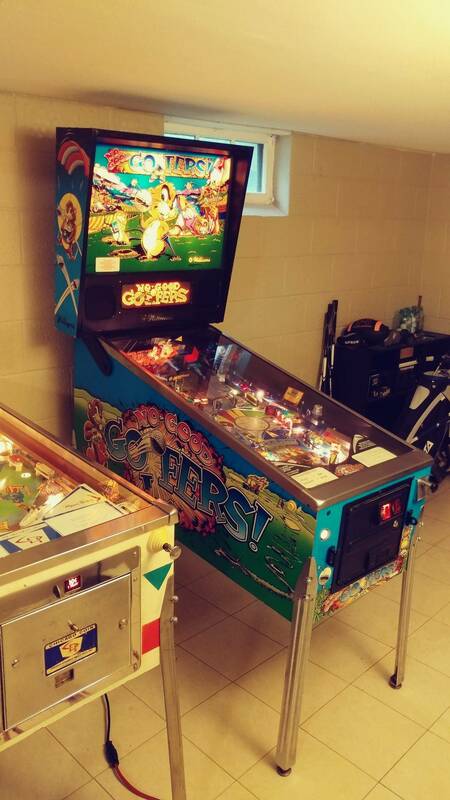 It is in good shape for sure, Knowing the spin sticker is less then 20 also is a good feeling as that and the gofers are the only real wear on it. The key area to watch out for is under the slam ramp. Wear there devalues the game dramatically, IMO. So I do recall seeing a bit of wear under the slam ramp. It was not terrible but some paint fade, it looked like it had a protective clear piece installed under it at some point. With it being worn is it still worth the value? Fade wouldn’t have anything to do with the ramp. Have a photo? Unfortunately I do not. Hard to remember what I saw. Eek. 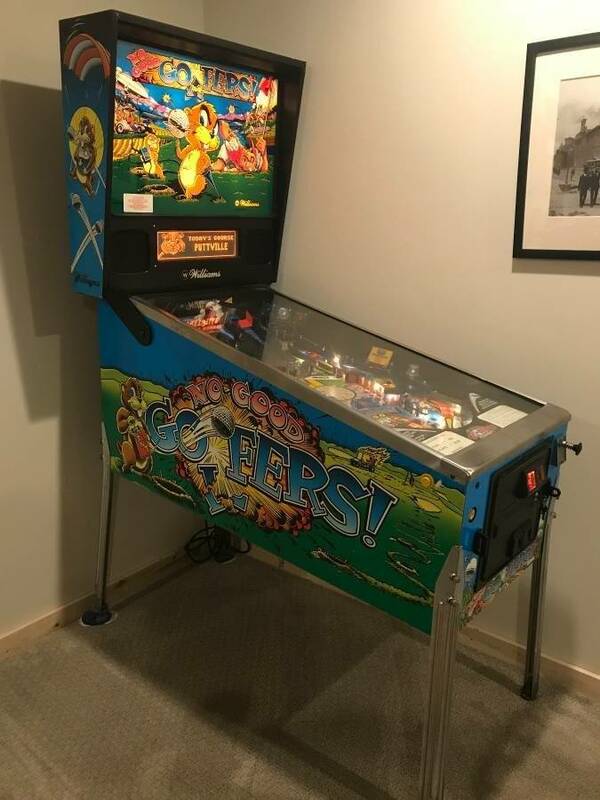 I agree with pinlawyer that wear under the ramp devalues the game but if it is playing correctly and a bit of chipping in that area is the only issue $3000 is still a fair price. Anyone asking 3500+ really shouldn't have much wear there. Here is under my slam ramp for reference, notice the scrapes on the left and right side. I would consider mine a players machine, it was a well routed re-import. There is an arch of chipped paint like the ramp had come free at one point and spun all over. 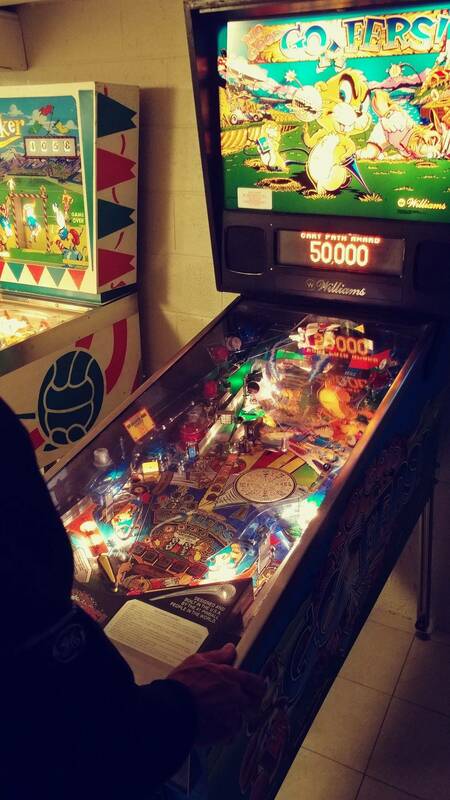 The usual places for marks are where the flap of the ramp touches the playfield and where the two posts come down. When you get it you can put felt under the ramp to prevent any further damage. My spinner had almost no legible text when I got it, this is what the new decal looks like when installed. I would pay 3k in the condition you describe. If after you get it, you decide it isnot for youthen let me know. I would take it, so keep that in mind. Ok thanks for the heads up. Did that wood decal on the slam ramp come woth yours? I really like that decal. Several decals come in the set. It's on my to-do list for mine. I think the big thing is the market is harsh/over priced in the Milwaukee area (as your probably aware). It would almost be dumb to pass up a fairly priced top 50 pin even with some wear. 3K is a steal, you could resell for more in a heartbeat. 3k is a fair price. I would stick with it. Will do thanks guys im pretty locked in at this point really excited to pick it up. Oddly enough, I was on my way to look at/buy this exact game when I got the call from the seller that the game had been sold. Needless to say, I wasn't too happy with the seller telling me to come on over and then have him calll me back 25 minutes into my drive saying "sorry, the game has sold" I'm thinking you were probably still there when he called me. Not sure what he would have done had we both been there at the same time. I found the seller to be flakey as I tried to get there Saturday to look at and he wouldn't commit to a time. I had pretty much written it off and then he called me this morning and said "if you're still interested, come on out". Hopefully, it'll be there when you go to get it tomorrow and he won't just hand you back your deposit and say "sorry about that". I called him last night to confirm and I mean it sounds like its mine (fingers crossed). He was very nice in person but I got that same vibe on the phone. He told me he had someone coming around 1 when I was at his house (assuming that was you) and a down payment would secure it. I thought it was odd someone was coming around 1 as I was walking out the door around 12:45, I thought he was trying to throw me off to put the down payment on it. Glad I did though. Next time just buy the game on the spot. Don’t bother with down payments. Saves time and any second guessing by the seller. My bank is closed on Sunday. He would not accept a full check. It was the only way I could lock it in. Great price. Buy it and if you want to move it later, use it as a trade offer. People are always looking for these machines. Let us know if the deal goes through or if the seller flakes on you. Pictures would be great too so that we can all admire your new machine. The overlays made for that area are pretty good, too. I was just past Brookfield square at around 12:30 when he called me. If you were still there at 12:45 and he hadn't called me, I'd have shown up while you were there. As it happens, had I not been out grocery shopping with my wife when he called, I'd have had an earlier start and I'd have been there when you showed up. When he called me to tell he had sold the game, I asked him why he would tell me to come when he had someone there already. He told me that you had said you'd be there between noon and 2 and that he didn't think you were going to show. Ultimately, it was a crappy move by the seller to waste my time telling me to come when there was a chance someone else would show up. It could have been very awkward, to say the least. Hopefully, things go smoothly today and I'm happy you got the game. Well guys here it is. 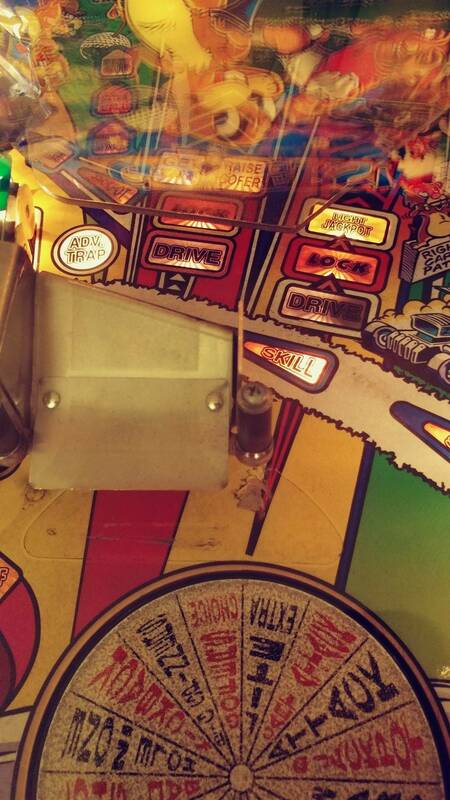 As you can see the playfield under the slam ramp is in fact worn/damaged. Only spot though. Its a bit dirty. I did a quick novus 2 wipe in a spot and made it look new again so it should clean up nice. Hopefully we'll get a chance this weekend. I just sold mine for 3200 last month. It was comparable in condition. Thanks guys, already ordered a new spin disk sticker. Planning to clean up this weekend. Will post pictures once updated. Another tip. You should take apart the spinning disk and clean out the black dust. It's amazing how much is in there. Also be sure to clean the spinner optos (Q-tip and some alcohol). I just shopped mine about 6 months ago. So I may have a few tips on cleaning. Congratulations, it's a fun game. If you are ordering parts you might want to pick up a new nylon bushing for the slam ramp. 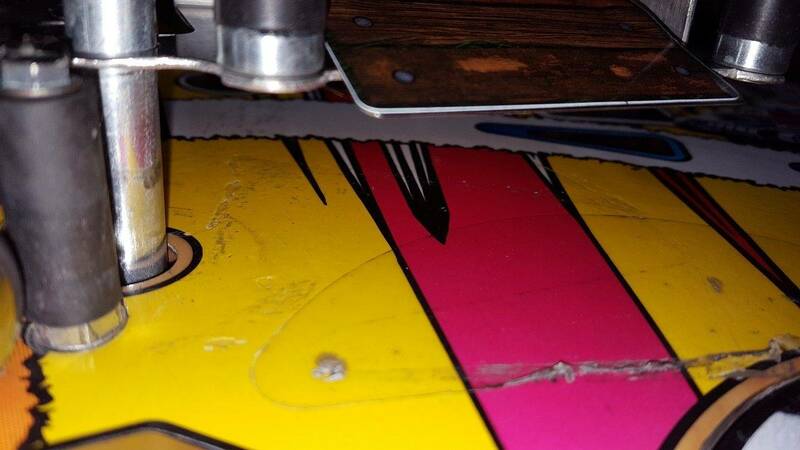 They get worn over the years and then the ramp doesn't come down evenly, it tilts to the outside causing it to hit the playfield.